As I finished reading this third installment in the arc, I concluded that while the artwork is kind of flat, the quality of Gaiman’s writing certainly compensates for that shortcoming. He is able to create wonderfully evocative text that conjures rich imagery in tight, neat snippets. A great example is the description of what it is like to arrive in Chicago by car. Chicago happened slowly, like a migraine. First, they were driving through countryside, then, imperceptibly, the occasional town became a low suburban sprawl, and the sprawl became a city. The focus of this issue is the exploration of forgotten gods, gods who were once important and then faded from memory. When we forget our gods and do not feed them through our consciousness, they die and disappear from existence. These are the gods who have been forgotten, and now might as well be dead. They are gone. All gone. These are the gods who have passed out of memory. Even their names have been forgotten. Gods die and when they die, they are unmourned and unremembered. Ideas are more difficult to kill than people, but they can be killed in the end. Since America is a country founded on immigrants, the people who came to America brought with them their old gods. These gods remained for a while, but eventually they were replaced by a new set of gods, or ideas, that arose along with the new country. No, we are all relatives. We come over here together. Long time ago. First, we come to New York. All our countrymen go to New York. Then, we come out here, to Chicago. Everything got very bad. In the old country, they had nearly forgotten me. Here, I am a bad memory no one wants to remember. As I observe what is happening in the world around us, I cannot help but sense that these recent gods we created in our modern world are about to collapse. There appears to be a paradigm shift beginning, one that will reshape our dominant ideas. I think this is why there is such a heightened sense of fear and urgency in our global society. I do not know how it will all play out, but it is definitely a fascinating time to be alive. I LOVED this issue! Not only is the writing flawless and well-crafted, but the artwork is superb. 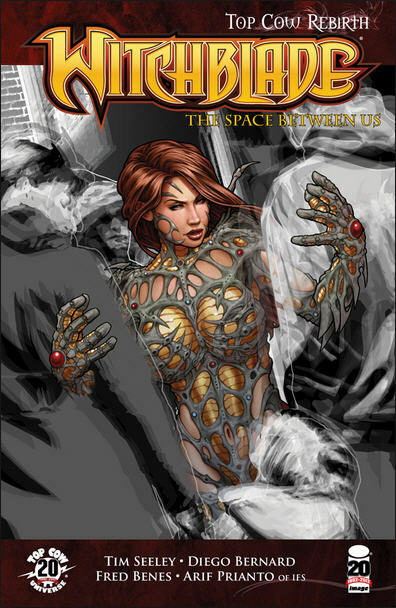 In addition, while it ties in with the larger Witchblade story, it is a stand-alone piece that can be read on its own. Basically, Sara Pezzini is investigating an apparition’s recurring visit. The spectral woman, who howls in agony, appears to her boyfriend who is tormented by his inability to end her anguish. It draws on the theme of the transition between life and death, particularly the purgatorial realm between the planes. Early in the episode, Sara muses on the reasons why displaced spirits haunt particular places. They say that haunted places are the home to people that couldn’t move on. That the ghosts found comfort in their old stomping grounds. I see this as true on a psychological level also. As humans, we seek solace in those places of our psyches that are comfortable to us, that we associate with our ideal of what was good about our pasts. I have often found myself retreating and haunting the areas of my mind that are connected with pleasant memories. I see spiritual “hauntings” as the physical manifestation of our innate desire to return to a place of safety and familiarity. The purgatorial space between dimensions populated by ghosts is referred to as the Ashen Lands. It is visually depicted as a spectral realm, void of color and painted with shades of grey. One of the ghosts explains the main reason why they choose to remain in the Ashen Lands: fear. It’s the world beyond the Ashen Lands. Where the dead are meant to be. None can know if it’s heaven or hell, or an eternal, silent sleep. Those of us here… we were too afraid to go. There are two appendices to this comic. The first is a supposed excerpt from a book that discusses The Ashenlands. It works really well and there is a great passage that describes the difference of appearance between the living and the dead. You may think me mad to have such a preoccupation with hues after such a traumatic event. But when one walks the Ashenlands, one comes to learn that it is the colour that sets us apart from the dead. Finally, the part of this story that I found the most fascinating is the inclusion of urban legends. The second appendix is a recounting of a Chicago ghost story that is referred to in the comic, that of Resurrection Mary. I did a search online and found plenty of sites discussing what is deemed as Chicago’s most famous ghost story. Click here to read a short summary of the tale. I love stories that blur the lines of distinction between real and fantasy, between life and death, and between the conscious and the subconscious, and this comic does that masterfully. If you can find this issue at your local comic store, I highly recommend that you pick it up and read it. You won’t be disappointed.